Every year when I go to Origins, I HAVE to go to Dirty Franks Hot Dog Palace. It’s a MUST visit restaurant if you like hot dogs. DELISH! 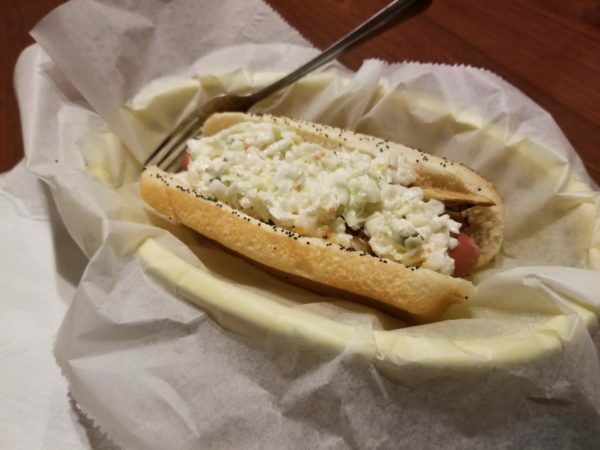 My favorite dog there has creamy coleslaw and french fries on it…yes it SOUNDS weird, but it is SO GOOD. A lot of their hot dog concoctions sound weird, but they are OH SO GOOD. Another great thing about this place? It’s open until 2 a.m. So you can play games until nice and late, and then go eat tasty hot dogs! When I’m not at Origins the rest of the year…I WANT this hot dog. Making it at home isn’t QUITE the same, but it’s still good! Place coleslaw mix in a large bowl. In a small bowl, combine the remaining ingredients; stir until blended. Pour over coleslaw mix and toss to coat. Refrigerate until serving. Soak the cut potatoes in ice cold water for 1 hour at room temperature. Drain very well and thoroughly pat dry with paper towels. Add the oil to a deep fryer and heat to 370 F. (If you don't have a deep fryer, you can fry them on the stovetop). Heat the oven to 200 F (to keep batches of fries warm). Place potato strips in a single layer in the deep fry basket. Lower basket into oil and fry in hot oil for about 3 to 4 minutes, or until golden brown and tender. Turn out fries onto paper towels to drain. Transfer to a baking sheet to keep warm in the oven while frying subsequent batches. When finished frying, sprinkle fries with salt. Once you have prepared the coleslaw, the hot dogs and the french fries; Place a hot dog in a bun, the put some french fries on the hot dog and smother it in coleslaw. Then enjoy!